In what has become an annual spring rite, USAID recently released its latest round of USAID Forward data. USAID Forward is a series of reforms designed to bolster the Agency’s operational capacity around delivering results, pursuing partnerships, and promoting innovation. A key element of this reform initiative is Local Solutions (formerly known as Implementation and Procurement Reform), an agency-wide push to increase direct partnerships with local governments, civil society, and the private sector. This year is a milestone for Local Solutions. At USAID Forward’s inception in 2010, then-administrator Raj Shah committed the Agency to directing 30 percent of Mission program funds to local entities by FY2015, from a baseline of 9.7 percent in FY2010. Spoiler alert: USAID didn’t hit its target this year. But despite missing its (rather arbitrary) mark, USAID has shown five years of slow and steady progress in increasing its local partner base, electing to take a deliberate, thoughtful approach to determine how and with whom it partners. While it remains to be seen whether increased staff and resources could have engendered more well-considered partnerships over the last five years, the Agency has committed itself to continuing down this path of partnership and sustainability beyond the arbitrary FY2015 deadline. But before we jump to the future, it’s important to take a look at the progress of Local Solutions’ efforts thus far. The portion of USAID program funds directed to local governments, civil society, and the private sector has slowly increased. As the table below shows, locally obligated resources (not including qualifying trust funds or cash transfers) have nearly doubled since FY2010. Data is not available for FY2011. Local Solutions isn’t only about government-to-government spending. Indeed, last year, for the first time ever, USAID directed more program funds to local private sector and civil society entities than to governments. Data suggest the Agency is working hard to diversify its partner base. Local Solutions isn’t driven solely by investments in Afghanistan and Pakistan. 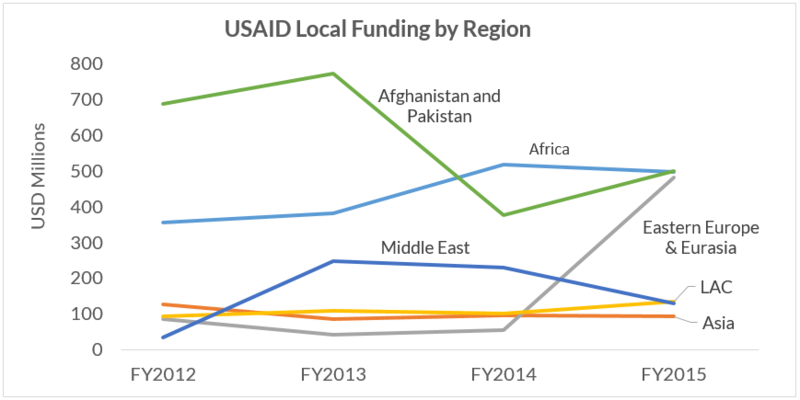 Even as local investments in Afghanistan and Pakistan have declined, the overall proportion of program funds directed toward local entities has increased. The regions of Africa and Eastern Europe & Eurasia currently see roughly the same level of local investment as Afghanistan & Pakistan. As with all USAID spending, the health sector leads in Local Solutions. But it’s not a run-away favorite. Interestingly, Local Solutions also has a big emphasis on programming in the economic growth sector through activities around the financial sector, infrastructure, and agriculture. The sectors that saw the smallest share of locally-directed funding in FY2015 were counter-terrorism and stabilization operations/security sector reform. Local Solutions isn’t confined to a series of tiny awards. The average program amount for Local Solutions in FY2015 was $864,879. Over 1,970 local entities across 78 countries and regions received program funding last year. The maximum locally-obligated program amount was a $330 million award to the Government of Afghanistan for work to support power transmission, expansion, and connectivity. USAID’s push to directly fund more local entities came out of the notion that an increase in local implementing partners would lead to an increase in local ownership and sustainability of development efforts. Now it’s time to measure these outcomes. Right now, USAID only tracks dollars disbursed to a local entity; this input measure is insufficient in offering real insight into the potential benefits and pitfalls of partnering with local organizations. The next five years should see USAID develop and monitor metrics that begin to uncover the outcomes and results of Local Solutions. Measures of organizational capacity can show how local entities are becoming more capable, while an increased number of ex-post evaluations can begin to show the sustained results of local implementation. A shift from dollars input to results achieved through local implementation should be the next target for Local Solutions. This is a guest post from Casey Dunning, Senior Policy Analyst at the Center for Global Development. This piece originally appeared on CGD’s blog on 5/6/2016.